The strong plastic container is the correct size and shape to hold a lamb with a rubber sling to support it's body in the water. The head hole is shaped to support the neck and keep the face out of the water to prevent drowning. 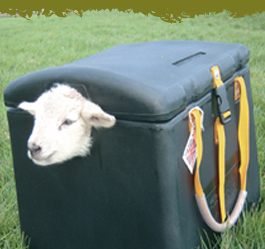 The tight fitting lid with clasp fastener retains heat and holds the lamb still, whilst the strong handles allow easy carrying of the Woollie Warmer. The tapered base gives the Woollie Warmer stability, enabling it to be used alongside the ewe. The insulation properties of the Woollie Warmer help keep the water warm. Because of the huge benefits of tube feeding fresh/warm colostrum whilst the lamb is being warmed inside the Woollie Warmer, we have included a starter tube feeding pack. It is recommended that you ask advice from a vet if you are unsure how to tube feed. Replacement tube feeding packs are available at all good farm merchants. See the Woollie Warmer in action.